One of our favorite classic horror movies is the Universal classic Creature from the Black Lagoon. 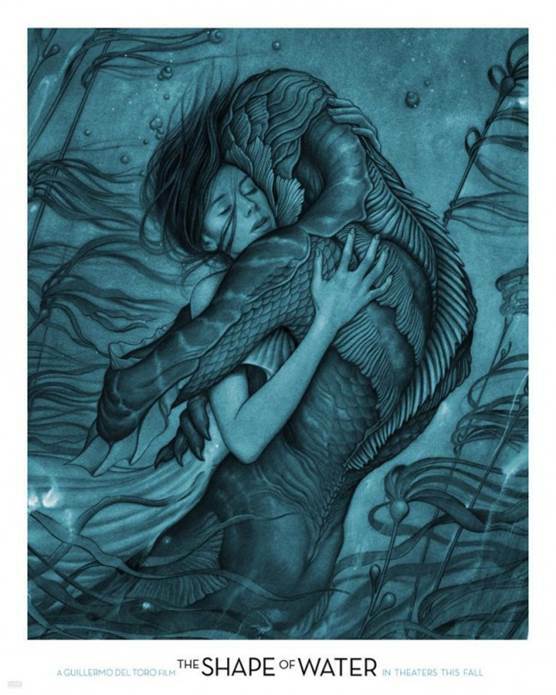 When we saw the trailer for Guillermo del Toro’s newest film, The Shape of Water, we were beyond excited! 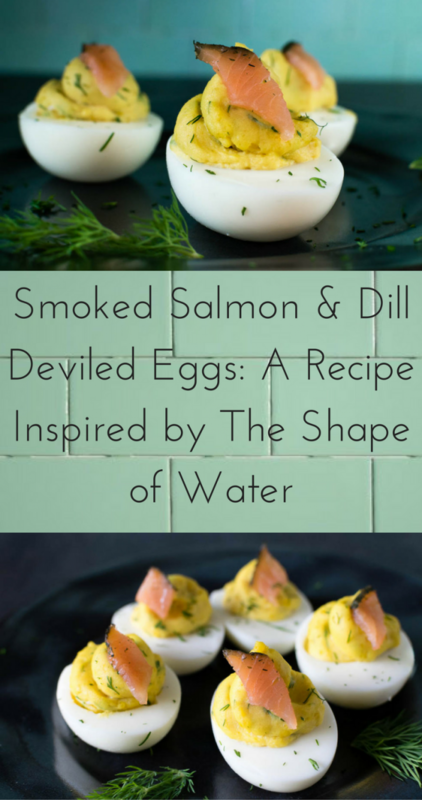 We’ve come up with a great new recipe, Smoked Salmon & Dill Deviled Eggs, for it as well. After reading about our newest dish, be sure to also enter our giveway at the bottom of the post! The Shape of Water is “an other-worldly fable, set against the backdrop of Cold War era America circa 1962. In the hidden high-security government laboratory where she works, lonely Elisa (Sally Hawkins) is trapped in a life of isolation. Elisa’s life is changed forever when she and co-worker Zelda (Octavia Spencer) discover a secret classified experiment. When it comes to finding an idea for a recipe we always start with foods found within the film. Lucky for us, The Shape of Water has a prominent food item, eggs. Despite creating a few other deviled egg recipes in the past, we knew this was the route to go. To tie the recipe to the movie we used not only green from the dill but also incorporated fish. 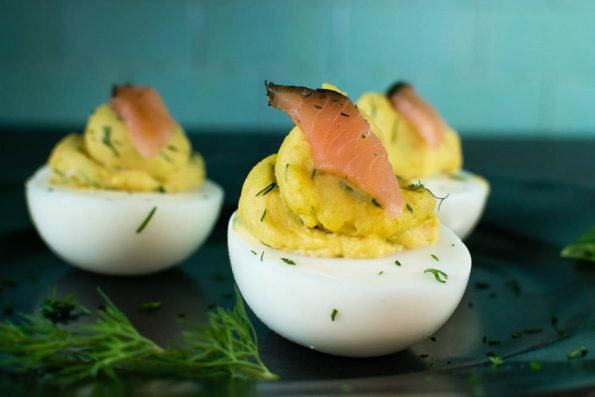 We hope you love our recipe for Smoked Salmon and Dill Deviled Eggs as much as we do! Now for the part you’ve been waiting for! We are giving away five pairs of screening passes for an advanced showing of The Shape of Water! The showing will be held at Harkins Tempe Marketplace on Wednesday, December 6th. The screening starts at 7 pm and the winners should arrive at 6:15 in order to guarantee their seating. Winners will be selected on Tuesday, December 5th. Good luck! In a bowl, combine egg yolks, mayo, mustard, and dill. Top with smoked salmon and dill (if desired). I copied down your recipe and want to try it out this weekend after Kitten Yoga. Thats great! Let us know how you like it. What a great looking recipe! So excited to try making this at home. I love deviled eggs but haven’t tried any made with dill before! Dill and Deviled Eggs are a match made in heaven! This sound like such a good combination, especially since I love deviled eggs and salmon. Dill and smoked salmon are my boyfriends favorite foods. Hopefully I can convince my chickens to start laying before his birthday so I can surprise him with a plate of them! Devilled eggs are always a hit. I just made some for a recent party….and they disappeared in a flash. I love deviled eggs! I love putting dill in mine, but have never made them with smoked salmon on top. I will definitely try that soon! Love deviled eggs and with my second favorite food, smoked salmon! This recipe is a definite win, win for me. Thank you! I’ve never had this combination before. What an awesome idea. Smoked salmon and deviled eggs sounds just perfect together. I’m going to give this one a try for sure! Yum. I always make basic regular deviled eggs because that’s what I like. I think I need to step my game up and get a bit more fancier. I love the sound of deviled eggs with smoked salmon. I really enjoyed the presentation and I love all thing smoked salmon so I will be trying this out soon! Oh goodness. You just took deviled eggs on another level with the smoked salmon. I’ve never tried devilled eggs but this will be a recipe i’ll Try. Thanks for sharing! You had me at “deviled eggs.” And THEN you added smoked salmon to the mix. These will be perfect for our NYE party tomorrow! How elegant! My family would looooovvvvveeee these. They are all smoked salmon fanatics!